An hour after the Intelligence Bureau confirmed that the serial blasts in Bihar’s sacred Bodhgaya were an act of terror, the home ministry has now stated the same, but have not blamed any outfit for the same. A home ministry source told rediff.com that it would take some time to ascertain the group behind the attack, but added that it was a coordinated attack, hence the terror tag. The idea was to cause a major scare and this is the doing of a terror group, the official said. 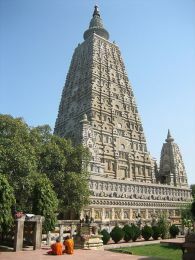 Repeated alerts and warnings since 2011 and a very strong one in the month of June 2013 were not sufficient to prevent a terror attack at the Mahabodhi temple in Bodhgaya, Bihar, early on Sunday. While the first of the alerts started to pour in in the year 2011, there was another specific alert on June 24 this year, following which security was stepped up at the temple. The district administration had in fact stepped up security in the temple premises. Commandoes were stationed and CCTVs were also installed at the temple and the surrounding areas which should make the job of the investigators easy. Even as investigators look for clues into the serial blasts, preliminary details emerging in suggest that at least five persons were involved in the attack and had planted the bomb as early as 2 am on Sunday. The pattern of the attack would show that it was a well planned operation and the bombers had visited the spot more than once in order to study the security pattern. They chose a time when the security apparatus was at its lowest and planted the bomb. It also goes on to show the desperation of the attackers who wanted to plant a bomb at any cost and make an announcement. The timing of the blasts clearly suggest that they had no major intention to cause destruction. They did not even attempt to destroy the shrine and hence it makes it clear that the intention was more to make an announcement and also scare rather than destroy.